‘Wide Shot/Close Up’ Wraps — Watershed Productions Inc. Wide Shot/Close Up was recently packed up as a new exhibit of aboriginal artwork is moving into Gallery A at Touchstones Nelson. 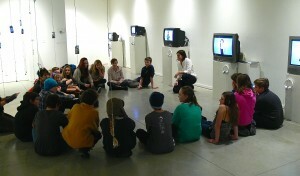 During the last two weeks of the show, I facilitated workshops in partnership with Touchtones for youth ages 11-19. 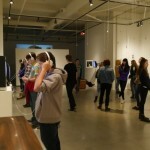 Dozens of youth from locals schools dove into the themes of the exhibit with great insight and bravery – participating in a variety of exercises that took a closer look at how we create first impressions, the creation of our own and others’ identity, and how it all relates to community building. 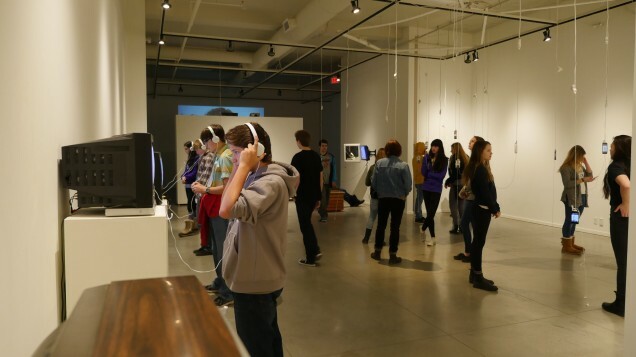 With each of the five video installations as a starting point for these exercises, the youth offered fresh insight and perspectives on themselves as individuals and within a social group. It was a great way to end the three month run of the show – knowing that the young people who participated in these workshops can carry the original intentions of the project forward into their local community. One part art installation, one part social experiment and one part community development exercise, Wide Shot/Close Up was intended to expose and explore how individuals present their own identity to others and how this impacts the way community is built. It is meant to engage a larger audience about the questions of how people from various backgrounds and beliefs can connect in meaningful ways. This project was funded by a major project grant from the Columbia Kootenay Cultural Alliance and the The Mir Centre for Peace is partnering with Watershed Productions on content and delivery. The Presenting Sponsor is Kootenay Co-op. Posted on February 17, 2015	in Filmmaking. Bookmark the permalink.